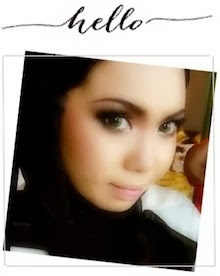 Shazwani Hamid's Blog: How do you shrink open pores on your nose and face? How do you shrink open pores on your nose and face? What can I do about the open pores on my face? Open pores on face give a bad appearance and attract lots of attention. Well..at least, MY attention! hehe.. So.. Is there any way to really, really shrink it? Do you have a home remedy to share? Some people told me to drink lotsa water to have a clear and smooth skin..
Exfoliate twice a week. and I've been trying to avoid touching my face too often as I know the dirt from my hands will transfer to my face, causing black heads..
Has anyone tried La Mer The Radiant Infusion? On the website it states, "This high-potency treatment infuses the skin with a cascade of activity to deliver extreme radiance, clarity, pore-minimizing and tone on demand. The Radiant Infusion's vital ingredients - ionizing sea salts, Radiant Ferments and super anti-oxidants - are suspended within a radical, fluid architecture. Expanding and contracting as necessary, the mesh-like sea gel works with La Mer's exclusive Deconstructed Waters™ to deliver extraordinary activity. Immediately, skin looks bright and refreshed. Pores that may have lost their integrity look tightened and refined, toning the skin's appearance. A natural source of electrolytes essential to the body's well-being, ionizing sea salts work in The Radiant Infusion to release a flood of beneficial negative ions, immediately energizing the skin and awakening a healthy, more vital and luminous appearance. Augmented with La Mer's exclusive Lime Tea and a super anti-oxidant cocktail, a combination of Radiant Ferments works to prevent the appearance of future discoloration, helping skin discover a refreshed, renewed, radiant life." Well, the brand La Mer is well-known of their Creme de la Mer (which costs a bomb! 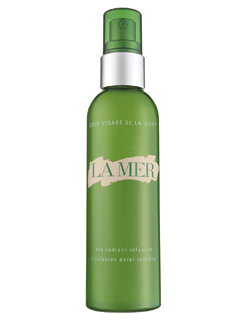 ), and that everyone knows about the miracle of la Mer. And I heard about La Mer on tv the other day and was intrigued by it.. But somehow I've always wondered about the effectivity of this product. Because sometimes products that expensive, are not necessarily good. So..I don't know whether I should get this Radiant Infusion or not.. But it does sound like an amazing product..hehe.. Hmm..I wonder how much does it cost.. Does anyone know? sis ..:)..my opinion..be careful with products that made from overseas..according to my sista yg pnah wat research menda2 KOsmetik ni..yg overseas lagi byk chemical..then x tau menda apa lagi they all letak is either halal or non halal.Bole pakai tapi kena tau ingredients dia..Tukar2 product pun bahaya gak..ermm..maybe petua org dulu2 lagi bagus..amik embun pagi2 sapu kat muka..hehehe...bukan stakat berseri..awet muda you!! kan haku dah ckp, clay mask can help to tighten pores. but don't expect to have ur pores tighten in just a few weeks' time if u've only started using mask after u've had open pores. i don't think it will totally shrink them all, but at least mask can help to prevent ur pores from getting any bigger, and also prevent new ones! prevention is better than cure, sistah! katak_78: hehe..yeke? embun tu yg mane ek? yg air yg kat atas daun tu ke? heh. along: yeah i knw..n i've been using clay masks from st ives yg bapak ketat tu..and clarins pink clay mask yg tak ketat lgsung tu for like 1 month+ da kot..
but ive found a solution to the predicament.. i start pakai serum after toning and then baru slap on the moisturiser..
or.. alternatively boleh gak kot try the other one from the same range..No7 Hydro Quench Pore Refining Serum It claims to reduce the pores and boost skin condition & tone katenye... tak penah try lagi.. The smallest tub of the Creme de La Mer which is 25ml is RM 505 je. Try la, it compliments the radiant infusion very well. esperanzie: urm..yeah i know abt this creme.. my mom used to wear it.. n she also said the same thing! hehe..
but i dont think this creme is what im looking for right now.. i think this creme is more suitable for 40's n above..
so obviously i cudn't effort it yet! hehe..
thanx for the information! sadly, here in malaysia there's no Boots kan..n i love boots,btw! hehe..but nvm, whenever someone yg i knal pegi sane, i'll order from them laa.. i must try it, since u said this product is highly recommended..
val: oh, really? i didnt know there's a small jar for this creme! thanks for the info val..
n how bout this radiant infusion.. do u know how much it costs? TQ. Wany/Val : Correction, the smallest jar they have is 30ml wch costs RM505. For Radiant Infusion RM415. Err.. I dont thk the product is for 40 above as m not 40 yet.. hehe.. BTW there's somebody I have met in early 20s has used the creme de la mer for past few years and OMG.. the complexion is porcelain like i tell u! BTW have u tried Biopur by Biotherm? Like ur sis iza said, it wont cure overnight.. Take few weeks. esperanza: oh, i really thot the radiant infusion is like 1k n above!! anyways, yeah..ive tried biopur before.. but it was quite a long time ago.. about 4 or 5 years ago..
i used it in my school days..
n at that time, i didnt have open pores like now..n i did not hv any skin problem pon..hehe..so..cudnt really tell whether its a great product or not..